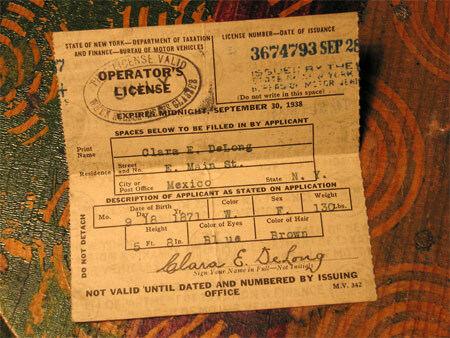 Tucked away in Vincent's diary is Clara DeLong's driver's license from the 1930s. I don't know how or when the license was put in the diary. Clara is my great-grandmother and the wife of John DeLong, Vincent's second-oldest son. On that note the transcription of the diary Vincent DeLong kept in 1864 comes to an end. In a couple of days I will reverse the order of the entries so that it reads in chronological order. I'll also make it easier to download the entire contents of the diary as one file. I can't believe it's over! Thank you so much for transcribing this and sharing. I can't remember how I first got the link to this site, but I've enjoyed it very much all year. It was great to learn about Vincent's life in his lovely lyric tone (and creative spelling). I just wish we could have had more insight into his secrets and war experiences. Any chance you've got other family diaries lurking somewhere? I can only second what Tricia has said -it has been a real delight to share Vincent's year with him - I shall miss his company. Thanks, Tricia and Shirley! You should try typing his creative spellings! It is going to be a challenge to correctly spell 'considerable'. There is another family diary. Clara's mother, Ellen Halsey Presley, kept a diary in 1911. It is more terse and depressing than Vincent's, but gives some insight into the life of a farm wife in upstate New York.